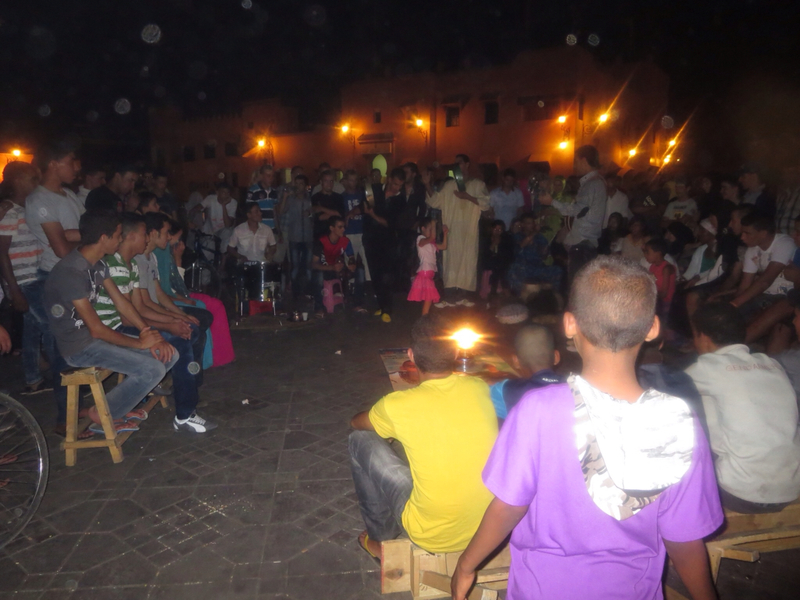 It's Not That Serious: Just another night in the Medina. Just another night in the Medina. 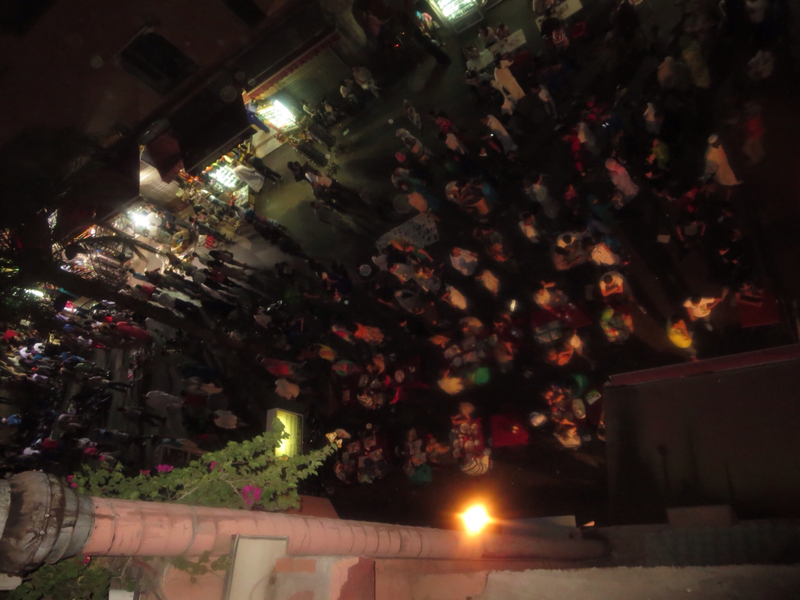 It's 11:30 on a Friday night in the old city, or Medina, of Marrakech, Morocco. I am in the centre of Jemma el Fna Square, one of the largest in the world. The air is thick with a plethora of smells, the strongest of which are smokey barbecue, spices, urine, horses, and sweat. 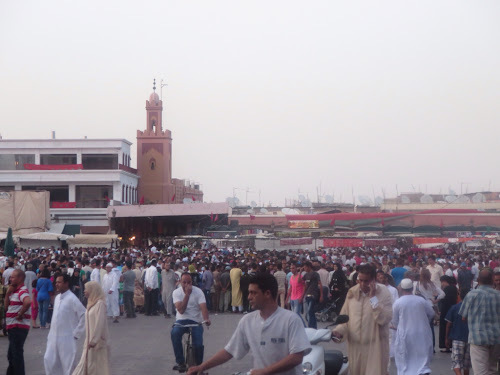 The constant hum of people talking Arabic, Berber, and French almost drowns out the call for prayer from the minaret tower belonging to a mosque adjacent to the square. There are snake charmers with sadistic smiles, waving their pets in my face. There are hunched-back old ladies wearing hijabs who look old and weak but have the grip of an Olympian as they grasp my wrist against my will to give me a "free" henna tattoo. We buy a bottle of water from one of dozens of vendors selling freshly squeezed orange juice...which I would've drank had it not been for flies and bees swarming the communal glasses that are used and reused without being washed in between customers. There are dozens of sharply dressed young men aggressively trying to lure me into their "restaurant" in the tent-covered food stall area, promising the very best food in the square. There is a little girl dancing to the beat of a Berber drum circle with her big brothers waiting in the wings to demand money from you if you snap her picture. There are old men wearing in flamboyant, yet tattered, red sombrero-like hats selling water from a tank strapped to their backs. There are teenage boys walking around in packs, often with an arm slung over a buddy's shoulder, trying to look cool and act tough as they crack pumpkin seeds between their teeth and spit the shells on the ground. They are almost no teenage girls. There are moms buying ice cream cones, cotton candy, and homemade nougat for the children while the fathers lovingly cradle the baby. There are men -only men- sitting on the patio of coffee shops that surround the square with one eye on the action and one eye on a soccer game playing on an ancient TV. A small boy tears into a piece of candy and does not hesitate in throwing the wrapper on the floor. He is selling cheap plastic toys that remind me of the ones dentists give to kids after their check ups. There are rudimentary carnival games, fortune tellers, blind violin players, and tourists from every nation. There are orthodox Jewish men and women taking a night off from seeking out the homes of their ancestors in the medina's Jewish quarter. It is organized chaos as people constantly pour in and out of the square from the labyrinth of over 7000 alleys that surround it. I imagine that from outer space, we resemble a child's ant farm. I'm not sure if its the 42 degree heat (a break from the earlier daytime high of 49) or the fact that the tagine I just ate was prepared suspiciously quickly or simply feeling overwhelmed by all that was going on around me but what I am sure of is that after a relatively healthy week in Morocco, my insides felt like my gastro-intestinal luck was about to run out. I needed to get out of there. Quick. We hop in an ancient yellow Piageot "petit taxi" and head back to our hotel. Almost immediately, I begin to feel better as all 8 meters of my intestines relax and breath a sigh of relief. But even as we venture farther and farther away from the square, the crowds aren't letting up. We ask our taxi driver if the crowds are due to the end of Ramadan. "No," he replies. "it's like that every night." 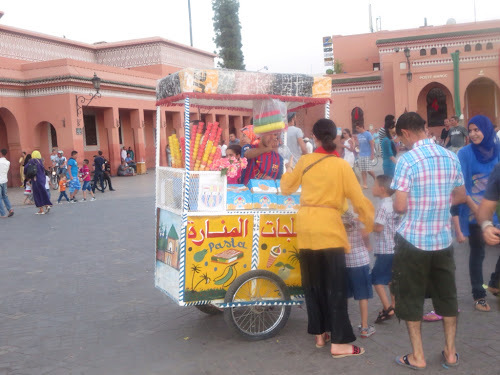 This is only a snapshot of Morocco. 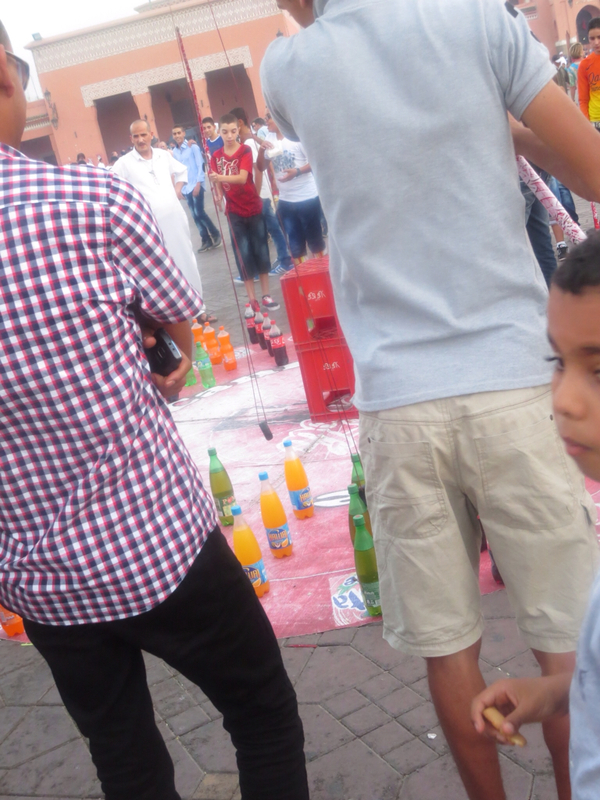 I had intended on writing only one blog post about my Moroccan adventure but now that seems impossible. I'll tell you another story tomorrow. You are such a phenomenal writer. 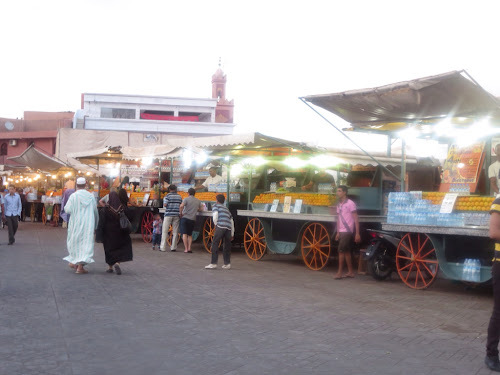 I felt like I was in the Medina with you, taking in the smells, sights and sounds. It's always been a dream of mine to go to Morocco, and while I've traveled many places, I doubt I will make it. However, I have thoroughly enjoyed living vicariously though your experience. 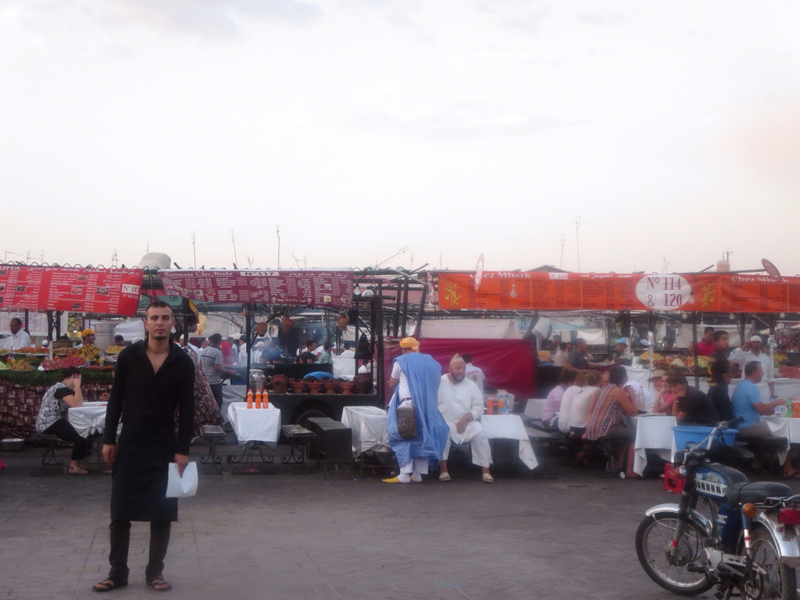 Best of all, I didn't have to suffer the GI distress in order to imagine how the tagine tasted. I hope you'll continue to post about your travels. Thanks, Joanna. It really is an amazing place. If you can, go there. It really opened my eyes to the world in terms of religion, poverty, culture,education, and more.